Melodieux is concentrating on Details Optimization and Customer Experience. Designs of Melodieux curtains allow you to decorate your windows with elegant surface. 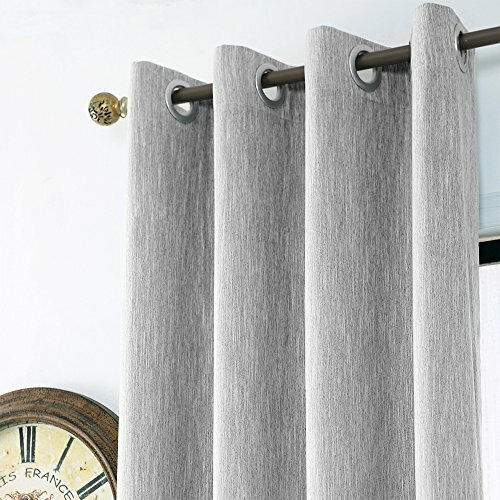 Melodieux curtains choose a newly designed grommet type-Noise-free Grommet, which inside is made of plastic so it won't make noise as sliding across the rods. We suggest you iron the curtains at low setting to remove wrinkles instead of machine wash, or it will be disappeared after hanging for a few weeks. When you need machine wash, you can use laundry bag or take apart the grommets which can be reinstalled. For proper fullness, panels should measure 1.5-2 times the width of your window. Allow slight deviation due to manual measurement.